I don’t know about you, but I have sweaty fingers sometimes. Recently, it has gotten so bad that I would be so irritated all day while working. Not only does it not feel good, it also hinders the smooth use of my trackpad, which they say is the best there is! Now imagine me taking a break to play Fruit Ninja or Sushi Chop on the iPad. After a few seconds of swiping the screen with my fingers like a lunatic, I would just give up because of the sweaty finger issue! I had been thinking of all sorts of solutions to this problem when I stumbled upon a brilliant idea: stick-on stylus that can be used on capacitive screens. Called Fylus, the stylus can be stuck onto your fingertips so that you still have the freedom of motion and the degree of control that you normally have when using your bare fingers to swipe and type on your tablet. Actually, the Fylus was created for a purpose totally different from my sweaty fingers issue. The inventors of the product were thinking of those people who have accuracy issues when using their tablet or phone (given that the device has a capacitive screen). I guess many can relate to this problem, especially on the smaller phones. How do you think “Damn you autocorrect!” got popular? With the Fylus, people who have those problems (I think the term fat fingers has been used in this regard, right?) 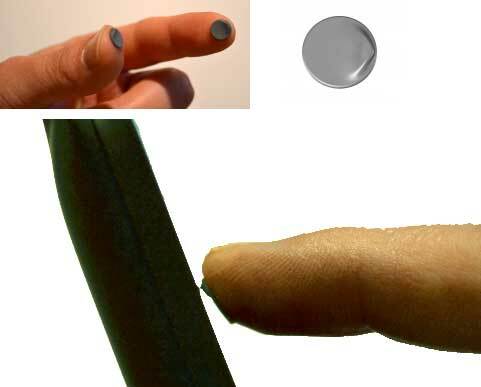 can easily and accurately use their devices using their “enhanced fingers”. This is how to use it, according to the makers. Step 1: Use your iPhone, Android, iPad or other touchscreen device and pay close attention to how your fingers touch your device. Step 2: Wash your hands. Step 3: Peel off the Fylus™ from the package liner. Step 4: Orient the Fylus™ on your finger, with the “bump” in the location where your finger will most likely touch the screen first. Step 5: Apply pressure to the Fylus™ to activate the pressure sensitive adhesive. Step 6: Repead step 3 and 4 for each finger you would like to use to interface with your touchscreen device. Step 7: FYPE like the wind! Interested? Get a pack of 8 for only $2.75!